Beauty Costs > How Much Does Screen Printing Cost? 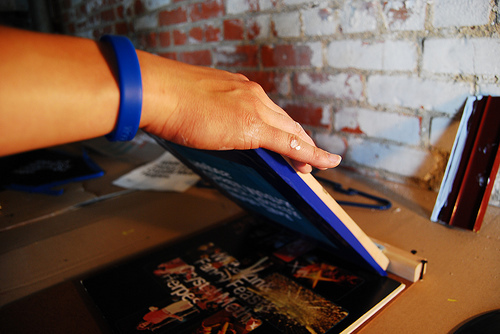 Screen printing is the process of using a woven mesh to support an ink-based stencil. This stencil can then form and transfer any image or color onto any piece of clothing such as a hat, t-shirt, sweatshirt and more. This process usually works best when the article is made of a polyester material, but it can be done to other fabrics as well. Screen printing is a great way to create custom gear for your place of business, school or sports team. On average, plan on spending around $8 to $15 per t-shirt. Larger items, such as sweatshirts and hooded sweatshirts, can cost anywhere from $18 to $29 each. With most companies, the more you purchase at once, the lower the “per item” rate will go. Usually, you have to create an order of more than 100+ to see a significant discount. Do not forget to factor in the setup and color fees. For example, Cheapestees.com charges anywhere from $2.95 to as much as $7.95 per t-shirt. The cost will greatly depend on the number of colors and the number of t-shirts needed. This will not include the $35 per color, per side setup charge. Zazzle states that their t-shirts start at $11.84, but you can receive discounts by ordering a greater quantity. NOTE: These are the averages from close to 10 websites we had looked at. Your results will vary, and remember, these costs can go down if you were to purchase more than 25+ at a time. Also, don’t forget to add in the setup fee if they were to charge one. Screen printing can be done on t-shirts, long-sleeved shirts, sweatshirts, tank tops, pants or sweats, hats, a bag and so much more. The piece you need screen printed will determine the base price of the project. The color of the item to be screen printed will affect the cost since a white shirt, for instance, is easier to print than a black shirt. The more complex the design, the higher the price will be. More colors will also mean a higher price. Most screen prints are done on the front or back of the shirt. However, the print can be done on other places such as down the sleeve, on the hood of a sweatshirt, or down the leg of a pair of sweats. Each location will require a different screen, which means the price will increase with each location. Most print shops will have a minimum order, usually 10 to 15, but many will offer discounts for orders of 100 or more. The price you are quoted for screen printing should include the t-shirts and all labor rates. The basic estimate will often be for a 100 percent cotton shirt, designed by a major manufacturer. When having something customized, such as a t-shirt, the screen printing company will usually need the number of shirts, the number of colors that will be needed, the style, the type of material and how fast you need it back. When submitting a picture, most will ask that it is in a JPEG, PNG, GIF, TIFF or PDF form. Most will limit you to eight colors to a shirt. Most screen printing companies will want you to provide the artwork for the items. However, if you need them to create something for you, they can do it for a minimal fee. The more colors that you need, the more you are going to probably pay. On average, for each color, plan on adding at least $1 to $3 per item. Double-sided printing can be an additional $1 to $4 per piece. An initial setup fee may be charged on top of the t-shirt price. This setup fee can cost anywhere from $10 to $45. The average turnaround time is seven days; however, many offer rush services that can result in a higher premium. A rush order, for example, could increase the costs by more than 100 percent. Placing a photo on a t-shirt can be costly as well due to the color separation process. Larger sizes such as XL and XXL can cost an extra $1 to $3 more per shirt. Typical t-shirts are going to be the color white. However, customers are able to choose darker colors. Darker colors can cost $5 to $10 more per shirt, depending on the brand and style. The estimates above are often for a plain white t-shirt, and if you were to upgrade the type of clothing, additional fees will apply. A long sleeve shirt, polo or baseball-type shirt can cost an extra $5 to $7 per shirt, while a hooded sweatshirt or sweatshirt can cost an additional $13 to $20 per item. Adding a number and/or name can cost an additional $2 to $5 per digit/name. Be sure to read the fine print. Many screen printing companies are going to include setup fees and more. If you can, try to limit the number of colors. The fewer colors you have, the more you are going to be able to save per shirt. Know the turn around times. Busier companies can take up to a month to return your orders. Even if you are ordering a range of sizes from youth to adult, the print shop will use the same screen. This means that your design cannot be any bigger than the size of the smallest shirt. The design may look normal size on a youth small but may look very small on an adult extra large. Consider having them make two different size screens; this should only cost you $50 more at the most. If purchasing online, shipping fees may apply, but it can be waived if you purchase the minimum required. Generally, the more shirts you purchase at once, the more you are going to save “per item.” Usually, large discounts can be had when you reach 500 shirts or more. The internet is jammed packed with companies that are willing to create your t-shirts. Make sure that you compare at least three to five companies. VistaPrint.com is known to have some of the lower prices when it comes to screen printing. Creeate your own design so that you do not have to pay someone to do it for you. There are many times that you can purchase the articles of clothing separately and then take them to the print shop to be printed. For example, if a store has a really good sale on sweatpants, you might pay less than you would if ordering through the print shop.